Home EU INSTITUTIONS Interview/Sven Giegold: The core problem is the systematic deconstruction of democratic institutions. "For the next Parliament, opinion polls expect that a strong pro-European majority will emerge. But the big coalition of Christian Democrats and Social Democrats will not have a majority anymore. 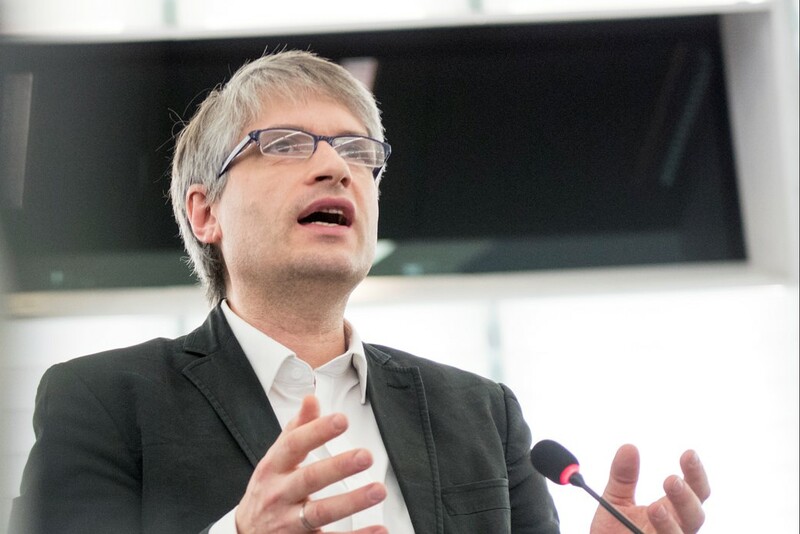 So, strong European Groups like the Liberals and the Greens will become more important," said Green MEP Sven Giegold. Just a few months ahead of the European Union parliamentary elections, fraud and corruption related to EU funds has attracted the interest of the bloc’s lawmakers. In reality, however, many questions are emerging about whether member states’ prime ministers and governments have breached EU law. Another issue is that the European Public Prosecutor’s institution, which will be a powerful weapon against fraud, has yet to be ratified by all EU members. European Interest met and interviewed MEP Sven Giegold, a leading member of the German Alliance 90/The Greens (Bündnis 90/Die Grünen), which is a member of the Group of the Greens/European Free Alliance. Giegold spoke about the upcoming EU elections and the rise of the Greens, as well as, the cases of fraud of EU funds in some EU member states. Of particular interest are his views about the European Parliamentary groups and their ties to some of their national members involved in corruption cases. Sven Giegold thinks that European forces should establish cooperation between them and that the role of the Liberals and the Greens will be important in isolating populisms. European Interest: The rise of the far-right in some of the EU member states emerge as a direct threat to the EU. How big is this threat? Sven Giegold: Obviously the rise of nationalism and of the nationally oriented populism is a big threat to European integration as a whole. But it will be a particularly big threat if the pro-Europeans will not dare anymore to lead. If they don’t use the powers we have in order to deliver successes, because they are frightened and scared of the success of the populists, then we will produce their own success. So, I remain deeply convinced that the only true and strong action for the rise of nationalism is leadership in the European institutions and the member states in order to deliver European successes. For the next Parliament, opinion polls expect that a strong pro-European majority will emerge. But the big coalition of Christian Democrats and Social Democrats will not have a majority anymore. So, strong European Groups like the Liberals and the Greens will become more important and this can give more courage than what we see with the big coalition. Do you think that EPP is decisive in isolating the far-right? Do we risk seeing a coalition like the one in Austria when countries like Italy or Austria will propose their commissioners? Obviously, I think that all pro-Europeans are determined to block the extreme right and the Eurosceptics. The EPP was often careful in moving towards a strong Europe but if they want our votes to build a pro-European majority with Liberals and Greens will probably need to be more courageous. When it comes to Commissioners, I would be very careful to not accept certain Commissioners a priori because they have a certain party book. I think that calling for boycotts will not be very wise. You mentioned a Strong Europe. Ten days ago, you launched your campaign posing to the voters the following dilemma: ‘A strong Europe or a right Europe’. A move to the right risks to not deliver the European promises. People are disappointed that too often Europe is not social enough. And that too often Europe is not green enough or not democratic enough… This is not the fault of the European institutions. It is because member states usually blocked reforms in that area and for that the European Parliament needs to push even harder to make Europe stronger. In the Czech Republic and in Hungary members of the government are under investigation for appropriating EU funds. Is there a real EU force to intervene in cases of corruption in member states? The institution of the European Public Prosecutor is one of the big points of progress of recent years. This EPPO has not being ratified by all member states. So, we are still missing several member states and we must push much harder these member states to ratified it. EPPO is particularly geared to misuse of EU funds as well as the fight against VAT fraud etc. It is important for civil societies of the member states to have a European actor tackling cases of corruption which might be more powerful than local institutions which tend to be politically biased some times. The ruling parties in those countries are members of European Parliamentary Groups. Should these Groups suspend membership until the investigation is completed? For me, it is unacceptable that pro-European party families accept member parties that are breaking fundamental values systematically in the member states. So, if you look at the Socialists in Romania or in Malta and their behaviour towards corruption. Look at EPP in Hungary or to Bulgaria but also ALDE in Romania. There are several cases were the deconstruction of the European values are under the umbrella of the pro-European party families and I think these parties shouldn’t remain in this families if there is systematically and in a long-term breach European values. Another case is whether such a membership should be interrupted because some individuals are found doing thing wrong. In my opinion, the misuse of funds when it comes to individuals is not the core problem in Hungary or in Romania. The core problem is the systematic deconstruction of democratic and juridical institutions. In the Czech Republic, I would say Mr. Babis doesn’t fit in this liberal party family in Europe. He is personally in trouble because of having accepted EU funds in a doubtful way and now the liberal group really should draw the consequences like with the Romanian member. In the latest elections in Netherlands, Luxembourg and also in two German federal states, the Greens enjoyed high electoral scores. Do you think that the Green parties are replacing the Social Democrats in the centre left political spectrum? I think it is not quite clear. Clearly in many EU member states the Social Democracy has lost its credibility because there were not ready to follow the values but rather they tried to please everyone. In the Netherlands, for example they defended the Dutch tax haven and in the same time being social democratic. In Germany, they were a party that was always open to environmental issues, but they were at the same time defending the coal industry. And also, in the social field they are not clear enough by standing with the poorest because they want to defend the wealthier parts of the working class. So, always when social democracy lost credibility then there is an open space and that open space is contested by different forces and in some states are the Greens. According to the poll this moment we are clearly the second party in Germany. But they are people flirting with the Greens they are not long-term supporters and it is in our hands and in the hands of SDs to see where these people will move from the electoral base of the Social Democrats to the Greens. This is still open. the answer to the crisis of the SDs is a party of modern left which stands with the values, that doesn’t compromise its values according to the finding of the polls. We believe that the answer to the crisis of the SD is a party of modern left which stands with the values, that doesn’t compromise its values, related to environment, migration, the defence of social rights, according to the finding of the polls. We are more committed to upholding our values and less interested in having everybody satisfied.